The U.S. Department of State warns U.S. citizens of the risks of travel to Niger due to terrorist activity, kidnappings, and high crime. 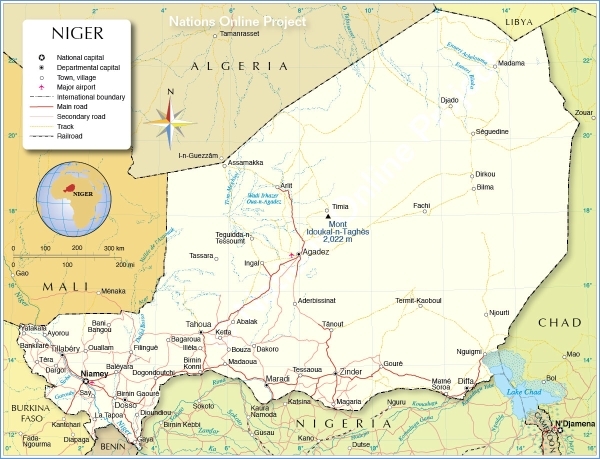 The Department recommends U.S. citizens avoid travel to Niger’s border regions, particularly the Malian border area, the Libyan border area, the Diffa region, and Lake Chad Basin area because of activity by various extremist groups including al-Qa’eda in the Lands of the Islamic Maghreb (AQIM), the self-proclaimed Islamic State of Iraq and ash-Sham–Islamic State West Africa (ISIS-WA), ISIS-Greater Sahara (ISIS-GS), ISIS-Libya (ISIS-L), and Boko Haram. Due to security concerns and travel restrictions, the U.S. Embassy’s abilty to assist U.S. citizens in remote and rural areas is very limited. This replaces the Travel Warning dated April 11, 2017. Terrorist organizations, armed groups, and smugglers operate in the areas bordering Mali, Libya, and throughout northern Niger. Mali-based extremist groups have crossed the border and carried out multiple lethal attacks on Nigerien security forces (FDS) and on U.S. forces assisting the FDS. The government of Niger has maintained a state of emergency in the Diffa region since February 10, 2015, and a curfew has been in place in the Diffa region since December 2014. The Nigerien government declared a state of emergency on March 3, 2017, for seven departments of the Tillaberi and Tahoua regions bordering Mali after a spate of deadly attacks. There is significant potential for violent crime outside Niamey, and armed criminals target travelers throughout the country. Outside the city of Niamey, all U.S. Embassy personnel are required to travel only during daylight hours in a minimum two-vehicle convoy and armed Nigerien government security escorts. There is a high threat of kidnapping by various terrorist groups, who have kidnapped Westerners, including a U.S. citizen, and threatened U.S. citizens in Niger. As a result of safety and security concerns, some organizations, including foreign companies, NGOs, and private aid organizations have suspended operations in Niger or withdrawn family members and/or staff. See the State Department’s travel website for the Worldwide Caution, Travel Warnings, Travel Alerts, and Country Specific Information for Niger. Contact the U.S. Embassy in Niger, located at 11201 Rue des Ambassades in Niamey, at +(227) 20-72-26-61, 8:00 a.m. to 5:30 p.m. Monday through Thursday and 8:00 a.m. to 1:00 p.m. on Friday. After-hours emergency number for U.S. citizens is +(227) 20-99-49-90-66.